Whether spanning acres or encased in amorphous glass ecospheres, Paula Hayes's singular landscapes blur the boundary between art and nature—and redefine the relationship between art and beholder. 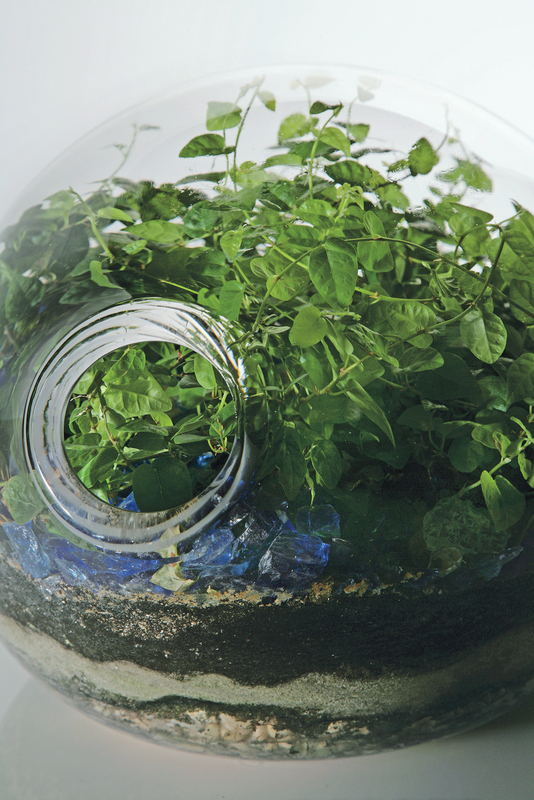 A close-up of a custom blown- glass terrarium offers a microcosmic view of one of Hayes’s lushly overgrown landscapes. Hayes produces her silicone planters in five sizes, two styles (“classic” and “eccentric”), and five standard color options. An assortment of mini silicone planters and polyurethane trays highlight a delicate assemblage of ferns and oxalis plants. Both the planters and the trays are produced in series by Salon 94, one of her two galleries. A cluster of maple trees sprout from a trio of Autumn Lake eccentric silicone planters and a Ginko medium classic planter in the courtyard of Hayes' gallery, Salon 94. Paula Hayes poses next to one of her creations. A garden for a private residence in East Hampton, New York, mixes a variety of heights and textures—even in the hatch-marked driveway. Three centuries before the English botanist Nathaniel Ward created the first terrarium in 1829, the Dutch painter Hieronymus Bosch depicted the world as one in his infamous triptych The Garden of Earthly Delights. Ward came upon the concept by happenstance: He’d been observing insect specimens under a bell jar and found that the small fern spores that sprouted from clumps of dirt within the jar thrived, whereas his outdoor specimens withered due to pollution. Bosch’s two-dimensional orb, painted on the exterior panels of his triptych, depicts what is supposed to be the third day of creation; when opened, the interior panels—and, in following, the interior of the orb—depict a world teeming with surreal landscapes, all manner of life and death, and the grimmest of afterlives. The portrait of mankind, according to the artist, is perfectly contained and encapsulated in an ethereal glass bubble. Paula Hayes strikes me as equal parts Bosch and Ward as she leads me down to her basement studio, or “grotto,” as she likes to call it. The dark, windowless space in New York’s Greenwich Village is illuminated by grow lights and warmed by plant specimens encased in biomorphic glass containers. “I love this one,” she says, pointing to a ball of organic matter slightly smaller than a volleyball from which a diminutive sapling has sprouted. “This little locust tree was just in the soil. You know, they’re huge shade trees…” She pauses as if to consider its fate and shrugs. “We’ll see what happens, I guess.” These new creations, called orchid bee blobs, are made from a host of ingredients such as melted beeswax, coconut fabric, spirulina, turmeric, gold leafing, and burnt umber powder and are cooked in what appears to me to be a much-loved Crock-Pot. While she may be reluctant to send the more com-plicated designs to collectors, she has more than 60 terrariums out in the world, and has tracked the progress and life of each one since she began making them in 2003. “I hope to never have to cut the cord with the terrarium,” she explains. “We have a whole database that tracks where they all are and how they’re doing. We have all their contact information and photos [documenting their development].” On one side of her studio, a large chalkboard is marked up with what looks to be some sort of elaborate equation, but is, in fact, a list of terrariums by code. “It takes a whole team of us,” Hayes explains. “For the first three months that [a terrarium] is with a collector, I’m working with them to try to train them how to take care of it.” Hayes’s team has grown by necessity—her office now consists of two in-house assistants and a horticulturalist who helps with onsite visits. Hayes reveres those clients who are willing to accept a degree of uncertainty. “The only thing that could go terribly wrong is if someone starts to think of [a] terrarium as an object. Because they’ll be highly disappointed that it changes,” she explains, laughing. “You know, I really try to talk with them about it.” And here, I see the temperament of the artist trump that of the botanist. Hayes walks over to a shelf and pulls out a sheet of paper and hands it to me, explaining that it was part of an exhibition she did in the early ’90s. It’s a contract that reads “An agreement for a potted plant as artwork.” The document spells out, in legalese, the obligation of an owner or collector of the art: “[T]he owner is responsible for the artwork in as much as the artwork does not exist without the responsibility and commitment to its undertaking and without the attempt to remedy failure with renewable idealism.” Hayes is clearly parroting the rhetoric as a way of restating our understanding of art and life. “Basically it states that it’s idealism that we’re maintaining, and if something goes wrong, we renew our idealism by putting in another plant,” she laughs. “[With this document] it was conceptual, it was more of an idea. But through a lot of soul-searching, seeing, and doing, I realized that even if [this idea] has a beautiful material form, it is still entirely ephemeral.” Indeed, it is art as life.